Pontevedra is both a province and a provincial capital with a long and often eventful history. The present location of Pontevedra is almost certainly not on the original site and theories and legends abound over the city's origins. Many stories about Pontevedra have been documented over the years suggesting that the city was foundered by a hero of the Trojan wars (Teucro), but these tales are almost certainly foundered in fiction rather than fact. More likely is the suggestion that Pontevedra was a stop on an early Roman road and the name Pontevedra, meaning "old or ancient bridge", can be found in biblical texts dating back as far as the 12th century. The Roman name for Pontevedra was "Ad Duos Pontes". Pontevedra was recognized in 1169 by King Ferdinand (II), who bestowed "charter" on the city. This charter gave Pontevedra special rights to trade as Galicia's foremost port and to engage in the preparation and sale of fish related products. In a world where fishing and seafaring represented a significant part of a nations economic strength, these privileges elevated Pontevedra's status in Galicia. For the next three to four hundred years Pontevedra prospered and expanded, becoming the largest and most powerful of Galicia's ancient cities. Fishing, farming and trading made Pontevedra the envy of Galicia and by the 16th century the port was established as an international trading stop. The good times were however soon to end as a series of unfortunate events almost destroyed Pontevedra. No single catastrophe was to blame, but problems caused by Spain's continual wars with England and their ally Portugal, combined with internal political unrest, symptomized by the increasing influence of Santiago de Compostela, started to take their effects. The Spanish inquisition and the decreasing population from wars and plague also removed some of Pontevedra's economic power and, when the long term erosion of silt finally clogged up the estuary, Pontevedra's fate was sealed. Pontevedra has enjoyed something of a reprise over more recent years. One of its many low points took place in 1822 when neighbour and larger provincial rival Vigo replaced it as the provincial capitol, but in 1833 this decision was reversed and Pontevedra's status has been secure ever since. By the way Pontevedra's most famous son is Christopher Columbus (Cristobal Colón), the man credited with discovering the America's. 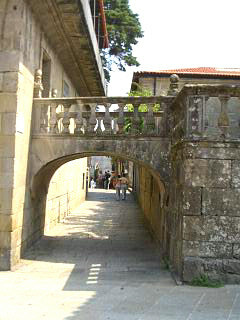 The photograph on this page is of an archway connecting two buildings close to the Praza de Lena (square) in Pontevedra's old town. Go to the Pontevedra home page.